Big News! I just read (5/13/12) that Renée Fleming is using supratitles for her recitals. 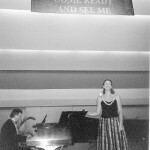 In a recent recital given by the soprano with pianist Hartmut Höll, as part of the Virginia Arts Festival at the Harrison Opera House, critic Shirley Thompson pointed out that using the Harrison Opera House supertitles system for the texts helped greatly, in a challenging program of Korngold, Shoenberg and Zemlinsky. The use of supratitles for the recitalist had a demonstration which is described below. Mary Chesnut, soprano and Susan McCreary, mezzo soprano with Eric Schank, pianist, took part. Many people in the opera world calculate the renewed interest in opera to the introduction of supra titles, supratitles or surtitles which provide a translation of the singing projected usually on or above the proscenium arch. The opera singer has the situation or story, costumes, make up, props and sets to aid the audience in understanding the words. The recitalist has no such aids. The recital singer may decide to tell the audience a few words about what is to be sung, but many singers dislike this because it changes the mood and they don’t want to speak just before singing. Providing the translations in the program means that the audience, not familiar with the language being sung, must continually look down at the program and back up at the singer. The lights must be left on in the hall to allow the audience to read the program. This has been the best solution up until now. 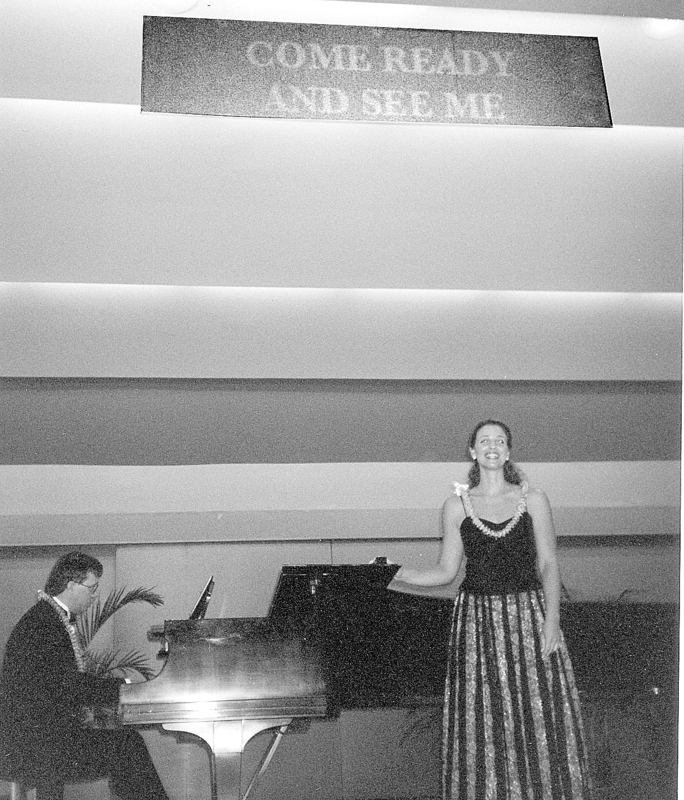 On 19 February 2001 we demonstrated projected translations for the vocal recitalist at the University of Hawaii’s Orvis Auditorium. An invited audience of about 40 people, some of whom were completely unfamiliar with song recitals, provided feedback after the performance. There were several objectives in the design of these supra titles. When these are used by opera houses, the equipment and screen involved are large. But we designed the components so that the itinerant recitalist would be able to carry the screen, projector and computer with the rest of the luggage. The interested presenters should be able to easily assemble these additional elements and run the titles. Technical details can be found at the conclusion of this report. At the Orvis Auditorium demonstration Mary Chesnut, soprano, sang two French songs, one in German and one in English. The mezzo soprano, Susan McCreary, sang in Spanish and both singers were supported at the piano by Eric Schank. We projected both the original language and the translation in different colors and fonts. Most of the audience appreciated seeing the original text along with the translation, though obviously this took up more space of the screen. If the original text hadn’t been projected, I don’t believe it would have been an issue. There is no need to project the original language. The goal is for the audience to understand the sense of what the original language poetry is about. It just happened that the program we used projected both the original and the translation. This option could be left to the discretion of the singer or the presenters. In the mood of experimentation, titles were also provided for the one American song for this English speaking audience. The singer didn’t find it insulting and the audience found it helpful. From the audience reaction there were obvious advantages to some color combinations and fonts. There was some discussion about experimenting with different colors and fonts which could prove even clearer to the eyes. The audience suggested lower placement of the hanging screen (which was about five feet above the singer) and more accurate timing of the titles with the singer’s phrases. The singers were very enthusiastic about the titles, one feeling that there was better communication with the audience because she knew they understood the meaning of the texts. She also appreciated the darkened hall, as did some in the theater. A few audience members found the supra titles distracted from their concentration from the singers, while the rest were able to quickly read the translation and return their attention to the singer. The fan sound from the projector was not noticed by anyone. There was a general feeling that the uninitiated would be more likely to attend a vocal recital if the ad included the announcement of supra titles. The overall audience reaction was extremely positive and enthusiastic. The screen: though there are portable screens made for such projections that are stretched on light-weight aluminum tubing which cost in the range of $500-$700, we opted in this demonstration to develop a temporary solution. We used 3/16 inch foam core that was 20 inches by 30 inches. Three of these panels were hinged at two joints by duct tape, making a screen 90 inches long by 20 inches wide. Bolts with hooks on them were inserted in the middle of each panel and on the ends of the screen. Thin gauge wire was attached to these hooks and other hooks were attached to the wire ends to hang the screen. There was a tendency for the panels to wave in the air and thus not to present a flat surface. To correct this, a pair of loops was glued to the back of both sides of the hinged panels and a small stick passed through to hold the panels flat. It was feared that the semi-gloss surface of the foam core wouldn’t reflect the projections well. This didn’t seem to be a problem. The complete cost of the screen was under $10 and weighed less than 5 pounds. The projector: we were told that most high powered projectors that could be placed at the back of an auditorium made quite a lot of noise due to their fans. So we chose a small projector (In Focus LP 435 Z) frequently used in business board rooms. This kind of projector is made to link up with a computer to project digital images (essentially whatever appears on the computer monitor is projected onto the screen). A friend loaned us the projector for our week of trials and demonstration. He told us that it cost $8,000. We have been told that these projectors are coming down in price. The In Focus weighs about 10-13 pounds with the carrying case and cords. We placed it on a plank on the back of a first row seat and aimed it at almost a 45 degree angle up to the screen with the help of telephone books. Though we were warned about distortion (keystoning) it wasn’t a problem, probably because we were so close. Also there is a feature on most projectors to correct keystoning. The computer: a Toshiba Satellite laptop which cost $1,800 was used. (This kind of laptop is much cheaper now.) The standard cord from the In Focus projector fit perfectly and when we pressed the FN and F5 buttons, our screen image (the translations) were received by the projector and thus shone on the screen. The laptop weighs about 7 pounds. The software: in our research on supra titles, we learned that opera companies and board rooms use an “off the shelf” software called PowerPoint made by Microsoft (which comes as part of the Microsoft Office suite). We used software developed by Robert Crawford which was provided without charge. –Yes, unsupported styrofoam definitely will wave around in the breeze. It also breaks rather easily, and looks pretty shabby after a couple of uses. That’s why most surtitle users employ a sturdy one constructed of either wood/canvas or metal tubing/canvas. Surely styrofoam is not going to stand up in the traveling? –You seem to be under the impression that the screen will reflect more light if it is has a glossy rather than flat surface. This is not the case. In fact, there is much more danger of getting glare from a glossy screen. The best type of surface to project on is a flat white or grey surface, achievable with painted scenic cotton or a dense styrofoam. –Regarding the software, I still recommend PowerPoint. It costs a few dollars (I’d get an actual estimate rather than depending on hearsay), but it is extremely versatile and well worth the money. As well, it is included in Microsoft Office 97 and Office 2000. Surely someone in your organization has a copy of that? The perfect software already exists with PowerPoint. There is a reason why most opera companies are using it — it does the job, and it’s not necessary to keep running back to a programmer for adjustments. Why re-invent the wheel if you have one that’s already running perfectly? –It’s a long way from running an informal demo in a university theatre to running a professional recital in a concert hall that seats perhaps 2500 people. It’s my guess that having the InFocus sitting on a board propped up on a seat is not going to wash in the latter type of presentation. You, and not I, however, are aware of the different performing environments into which your system will be introduced, and I am sure you are already sensitive to this issue. –For a larger venue (ie. a concert hall), you will definitely have to project from the projection booth onto a much larger screen. As I mentioned before, the stage (and orchestra or piano) will have to be miked so that program sound can be piped into the booth. –Also, I doubt that the brightness intensity of the InFocus [the projector that we used] will suffice in a larger venue, not to mention the resolution. I’m guessing it’s only 800 x 600 pixels. Am I wrong? As well, you are definitely going to need a long-throw zoom lens to get the lines of text onto the screen. –Here are some sample parameters below for you to look at. This would be using the Sharp NV6XU projector (brightness = 2200 lumens, resolution =1024 x 768 pixels) AND a specific long-throw zoom lens (focal length range 5.2-8.7″) from Buhl Optical. Column “T” is the “throw”, or distance from projector to screen; column “WPI” is the width of projected image; column “RSW” is recommended screen width; column “RSH” is recommended screen height; column “ESA” is estimated size of audience assuming a full house. The last column is a big “?” other than for the two actual real theatres shown. This is because the theatre architecture can be so different for two theatres having the same seating capacity, which affects how close an audience member is to the screen. I hope you are NOT going to project the foreign text as well as the translation! In my opinion this is not necessary. At the very least, you will tire the audience out reading. “Less is more” is also applicable in this case, I think. Audience (email) reaction, the first from a German speaking Austrian woman who is a classical music enthusiast, the second from an American woman with little exposure to classical music. It was very interesting to me what you said about Marilyn Horne’s efforts to make the content of the song clearer to the audience and that she only gave up the idea for physical reasons. What is the Finish project – similar to yours? How dare they……PLEASE CHARGE AHEAD! A few more comments -1. As a novice art song listener, I was confused and concerned when the surtitles disappeared, and this made me stop listening to the singer. I would guess that only singers and sophisticated audiences with trained ears would realize this was intentional. If you had announced this was going to happen, and why, it would have alleviated my concern – but I would still prefer to see the titles even during repeated phrases. 2. I liked the height positioning of the banner. It was far enough away from the singer that had I NOT wanted to look at it, it would have been easy to ignore and would not have distracted me – which your sophisticated listeners may do. If it were lower/closer to the singer, I think it would be more of a distraction, and harder to ignore. 3. Although I voted for the simplicity of black and white, I meant to add that it is important that there be a distinction between the two languages, and if this has to be done with color, that is ok, as long as it is not garish. I like the choice of 2 sized fonts. I would prefer sans-serif fonts, I think they are easier to read at a distance. 4. I liked the phrasing as you had it, and would NOT want longer phrases displayed. You seemed to strike exactly the right balance between displaying what the singer was capable of in one breath, and something that was a fast read and therefore freed up my eyes to go to the singer. Anything longer up there would have made it harder to give my focus to the singer. I have to say that this dramatically improved my enjoyment of art song performance – made it approachable for me. Although people who already appreciate art song seem less likely to warmly embrace the change, if your aim is to expose art song to people who are not aware of it, to new audiences, this is definitely the way to do it. I have written to Gary to ask him more about this. Would definitely like to try it myself. Steven Chung wrote: Not only by providing a visual distraction to those in the audience who -do- know the words, but by cultivating audiences who rely on approximate visual translations and not the words themselves as sung. Over the long term, I fear the death of diction. There is no more distracting setting for a concert than 1) lights on so people can read programs (and meanwhile BTW look around the house too), 2)people with their eyes buried in programs following two columns of text and translation instead of able to watch the singer’s face and body, 3) rustling of programs. Besides, over the immediate, never mind the long, term I fear the death of the song recital, period – as I have communicated recently in another post/thread, “W(h)ither the art song recital?” Our culture is in the process of moving from a linear, printed-word culture to one which embraces multi-media. (There have been some fascinating essays on how this indicates a fundamental paradigm shift from a masculine/linear spiritual age to a feminine /non-linear one, but we won’t get into a millennial “return of the Goddess” discussion here.) IN any case, there is no turning back the clock, I believe — Marshall MacLuhan (sp?) was quite prescient in his 1960s theories that the medium itself was becoming the message. Notice how opera companies now only cast singers who don’t *look* the part in the difficult-to-cast roles and heavy Wagnerian-size repertoire. I am a lover of words, and have always been a purist about including original texts and translations side-by-side in programs. But at lister Bruce Rameker’s recent Rialto Ensemble concert, they used just brief translations of the gist of each aria or duet, a sentence or two long, and while as a listener/looker I missed the nuances of some lines that I couldn’t “hear” fast enough in Italian, I was much more engaged in what there was to see on stage than I would normally have been. Rialto also recognizes that ours is a culture where people are looking for more complete “entertainment,” hence their semi-staging of programs. I used to think it meant people were becoming more stupid, or at least more poorly educated, to need “eye candy” to bring them into classical music performances. Now I think differently, at least some of the time. We are losing certain things, no question: who learns much about poetry OR classical music in school? Kids aren’t necessarily being taught to grow out of having the attention span of a fruit fly. But I think our brains are literally learning to make different kinds of synaptic connections in this new multi-media age, and what we gain if we also adapt is a different kind of appreciation of art and music, an ability to have an experience that comes in, or at least appears to come in, more globally, more simultaneously through all the senses. It’s a different kind of attention training, as it were, and it creates a different kind of demand of those of us who want to bring either culture or entertainment to an audience. Supra titles are one of the factors bringing more people to the opera house. If an art song audience occasionally laughs too soon at a funny line, or glances up from the stage to the title (rather than having to completely re-focus their eyes from near to far vision) it’s a small price to pay for the possibility that more people will find this exquisite art form “accessible” enough to actually attend a concert. It doesn’t mean they are rubes. It means they are interested — and paying money to come in. Since chamber music series presenters often say that people will stay away in droves if they present a singer, I’ll be especially interested to see how the presenters respond to this possibility of making art song recitals seem less arcane, more approachable. On Thu, 1 Mar 2001, Steven Chung wrote: Am I the only lister who thinks this is a very bad idea? Not only by providing a visual distraction to those in the audience who -do- know the words, but by cultivating audiences who rely on approximate visual translations and not the words themselves as sung. Over the long term, I fear the death of diction. Sounds like a great idea and experiment to me! I, too, like the idea of a darkened room as my best experience with lieder appeared in a small room lit only with candles. The foam core contraption is a great, simple idea that anyone could do. You might write up your description of how to make it and post it on the website for downloading by students/presenters. Should be worth an article in some of the vocal teaching/performance magazines, inc. Opera World, etc. Power Point is widely used (my sister uses it). But Filemaker Pro would also work as you can click on a “flip chart” for each phrase and pop it up easily. If the projector gives out a round light source that is too large, consider putting a piece of tape across top and bottom of the outer lens area so the light streams through a horizontal band. This is quite a fascinating development in the history of art song! Judy S.